Reshape your conception of what it means to grow old and equip yourself with the tools your clients need to lead a long, healthy, happy life. 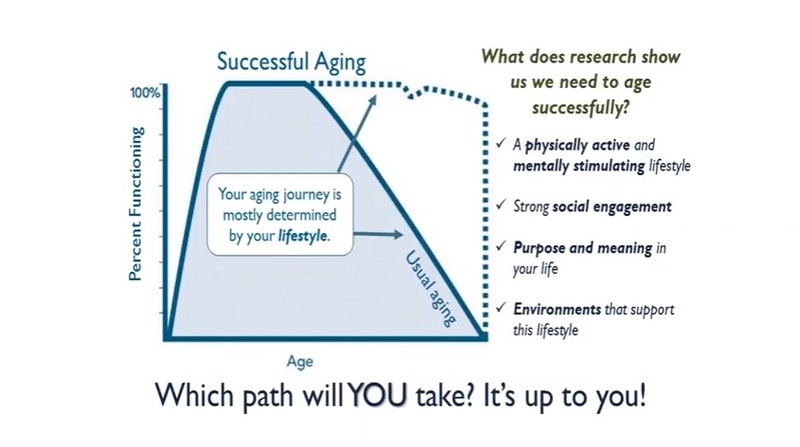 Learn the history and latest research on successful aging and how to translate the research into action in the day-to-day. Gain an understanding of Masterpiece Living, how it works, it’s exciting outcomes to date, and how everyone can be a part of the movement. Learn how to quickly identify ageism and how to respond as well as provide immediately applicable tools to inspire clients to age more successfully. Over a decade ago, a landmark ten-year study by the MacArthur Foundation shattered the stereotypes of aging as a process of slow, genetically determined decline. Researchers found that 70 percent of physical aging, and about 50 percent of mental aging, is determined by lifestyle, the choices we make every day. That means that if we optimize our lifestyles, we can live longer and "die shorter" - compressing the decline period into the very end of a fulfilling, active old age. A Master of Public Health with experience in the fitness, acute care and the aging field, Teresa has a passion for helping older adults engage in lifestyles of active, successful aging. Certified in personal fitness training and lifestyle and weight management coaching, Teresa formerly owned and operated an older adult-oriented personal training studio. As an outcomes analyst in the acute care industry, she was responsible for data analysis, outcomes reporting and quality improvement initiatives. A seasoned presenter, former health and fitness newspaper columnist and author of several articles, Teresa has particular interest in data-driven decision making and sharing best practices. As a Director of Operations, Teresa oversees the daily interactions that actualize the mission of Masterpiece Living. She also serves as the main point of contact for primarily west coast partners, is a member of the Masterpiece Analytics Team and is responsible for Masterpiece Living`s first ever partnership with Affordable Senior Housing communities. This rewarding role allows her the opportunity to collaborate with talented professionals to inspire lifestyles of successful aging and ultimately help to make our country a better place to age. Teresa`s own successful aging pursuits include training in Krav Maga, learning to speak Portuguese, and spending time on horseback. A Certified Senior Advisor and member of the Ethics and Disciplinary Council, Lisa is the Vice President of the Vision Recovery Center in Las Vegas, a non-profit organization providing financially challenged children and adults with visual aids, therapy, new technology and other services – enabling independence, confidence and hope. A lean management trained executive and Six Sigma Black Belt with a BFA in Communications supported by Minors in Public Speaking and Creative Writing, Lisa is a longtime advocate of healthy living and successful aging. She dedicates 4 hours weekly to volunteering and is a staunch believer in the impact animals have on older adults. She also sits on the Board of Directors for the Southern Nevada Parrot Education, Rescue and Rehoming Society, is owned by two birds, and has been foster mom to five others. Lisa is also a long time member of K9 Therapists of Las Vegas and Therapy Dogs Inc. She is owned by one adorable pooch who has logged over 1000 hours of visits to hospitals, hospice and senior communities. Lisa’s successful aging pursuits including reading, gardening, sewing, making jewelry, and pedaling around rural areas on her 3-wheel bike with her therapy dog happily sitting in a basket enjoying the ride!